Need a quick and easy party appetizer or weeknight meal? 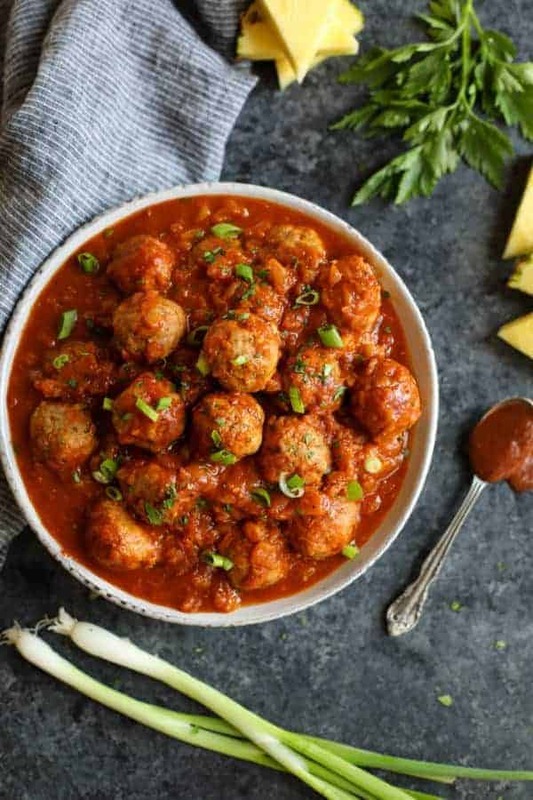 These Pineapple BBQ Chicken Meatballs are ready in less than 30 minutes. This post was created in partnership with our friends at Primal Kitchen. Few things are worse than accepting (or extending) that last-minute invitation for a party in which you need to bring an appetizer. I can see why potlucks and parties are often filled with chips, dips, and shrimp rings – they’re a no-brainer to bring (no judgments here, I’ve been known to tote a few shrimp rings to parties). But too many chips does not a great party make despite what my kids will tell you. That’s why I’ve got a super quick and easy appetizer for you today. 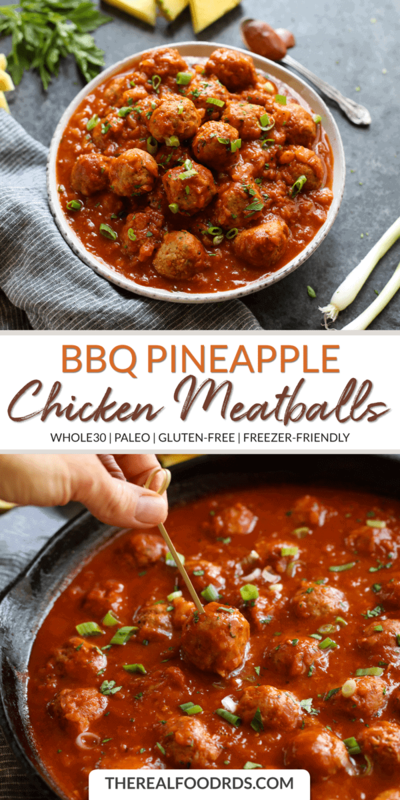 These Pineapple BBQ Chicken Meatballs come together in less than 30 minutes, require just 8 ingredients and they can be made ahead and frozen or popped into the slow cooker to be kept warm while the party rocks on. You can never go wrong with meatballs. Did you know that some of our most popular recipes are for meatballs? Yup! 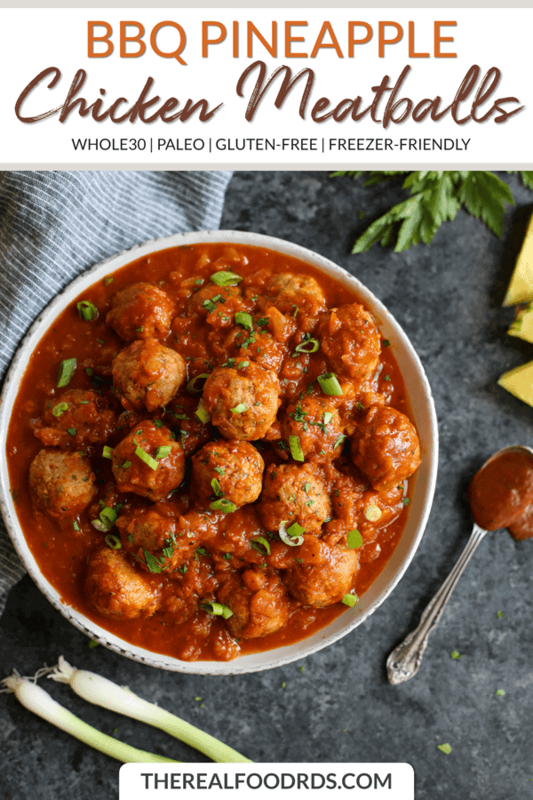 Buffalo Chicken Meatballs, Zucchini Turkey Meatballs, Instant Pot Meatballs and Marinara, Apricot-Basil Breakfast Meatballs… so many meatballs and for good reason. They’re easy to make, freeze beautifully so you can have them on hand for quick eats, and perfectly portioned for an appetizer when you need one. 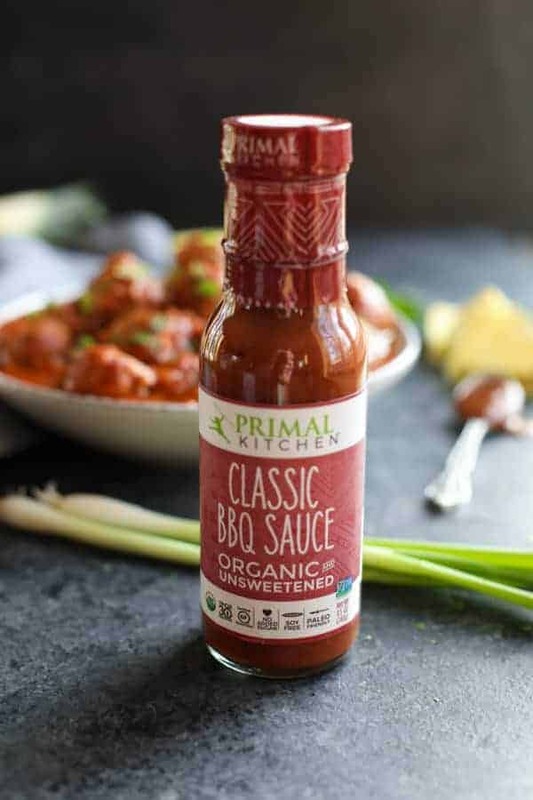 And you can never go wrong with a super clean and sugar-free barbecue sauce like the new Primal Kitchen Classic BBQ Sauce. Now you have a sugar-free and Whole30-approved way to marinate your baby back ribs, slather your meatballs, and dip your sweet potato fries with reckless abandon. It’s the ultimate cookout condiment for grill masters and sauce lovers and anyone looking for a way to add some bold, smoky flavor without junky ingredients. The best part? This Classic BBQ Sauce (and the Golden BBQ Sauce) is 100% unsweetened: No High Fructose Corn Syrup, Agave, Honey, Dates, Maple Syrup or Cane Sugar. It’s also USDA organic, Non-GMO Project verified and certified gluten-free. Though you’d never know it because it’s so good! 3 ingredients are all you need for the perfect sweet-smoky-spicy bite. Did I mention that these are soooooo easy? As in 8 ingredients and ZERO chopping easy? 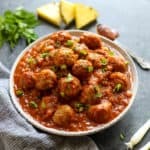 I swapped the chopped onions, garlic and parsley in the recipe for dried ingredients you probably already have in your pantry and the sauce is just BBQ sauce, canned crushed pineapple, and broth. Nothing else. So simple. You have no reason not to make these for your next gathering or as an easy weeknight meal (I’m currently obsessed with serving them over spaghetti squash). Don’t delay, it’s time to party! Go ahead, accept that party invite – or better yet, text your friends and invite them over for a last-minute shindig even if your house isn’t clean. Connection with friends over good food is the ultimate way to feed your soul. 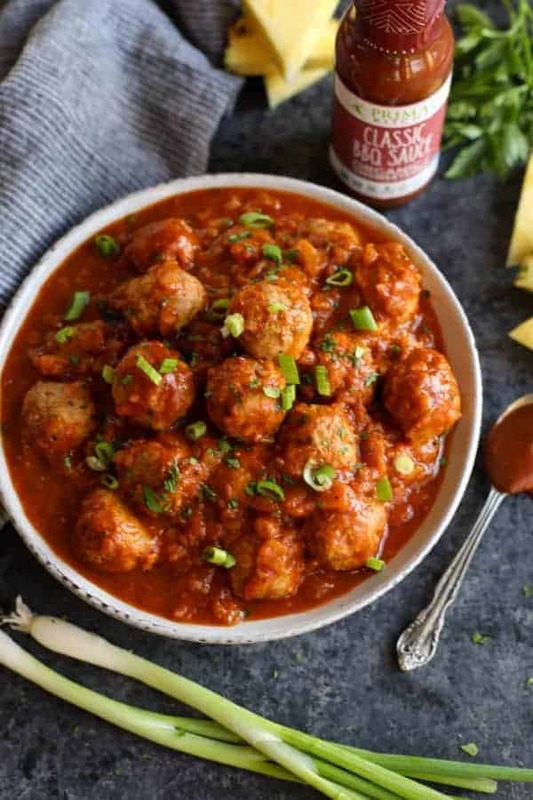 Of course, these Pineapple BBQ Chicken Meatballs aren’t a bad way either! The ultimate quick and easy appetizer that doubles as a hearty, Whole30-friendly weeknight meal when served over spaghetti squash or cauliflower rice. In a large skillet, combine crushed pineapple (and its juice), BBQ sauce and broth. Bring to a vigorous simmer, stirring occasionally. Reduce heat slightly and allow to simmer while you make the meatballs. Preheat oven to 350℉. Line a large rimmed baking sheet with parchment paper or a silicone baking mat. In a bowl, combine ground chicken, almond flour, garlic and onion powders, salt, pepper, and parsley. Using a small cookie scoop or a tablespoon, shape meat mixture into 18 golf ball-sized balls and place on baking sheet leaving a little space between each one. Bake for 12-15 minutes or until cooked through and no longer pink inside. When meatballs are done, add them to the sauce. Stir to coat and garnish as desired. Meatballs may be made ahead up to 3 days in advance and reheated prior to serving. 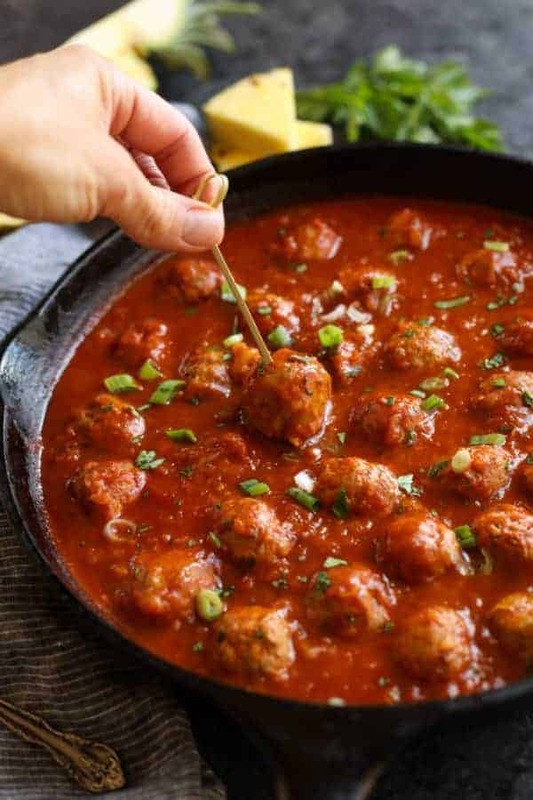 To reheat for a party, consider placing meatballs and sauce in a slow cooker set to low (or high, depending on how much time you have or don’t have) until heated through. You may need to add a few tablespoons of water if sauce starts to get too thick. Garnish before serving. Meatballs may be frozen for up to 2 months. You can either freeze the meatballs and sauce separately or freeze them together. 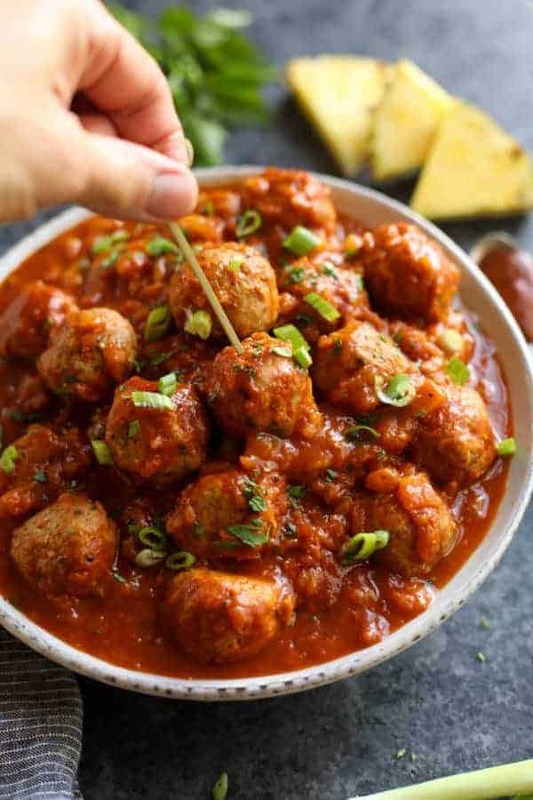 Allow meatballs to thaw overnight in the fridge, then reheat as desired. What’s your favorite quick and easy appetizer when entertaining friends or family? Share in the comments below! This post was made possible by our friends at Primal Kitchen. Although we received compensation for this post, the opinions expressed here are – as always -100% our own. Thank you for supporting the great companies we work with thereby allowing us to continue creating great recipes and content for you. Can I use the homemade bbq sauce from your site for this recipe (in place of primal kitchen one). Thanks in advance! Can flour be omitted or Any recommendations for other types of flour? My husband can’t have almond, cashews, wheat, oats or rice flour right now due to allergy testing. Can tolerate coconut, but worries that it would be mushy. Thanks! Really enjoying some of your recipes recently! You could omit the flour and they will still turn out and be delicious!